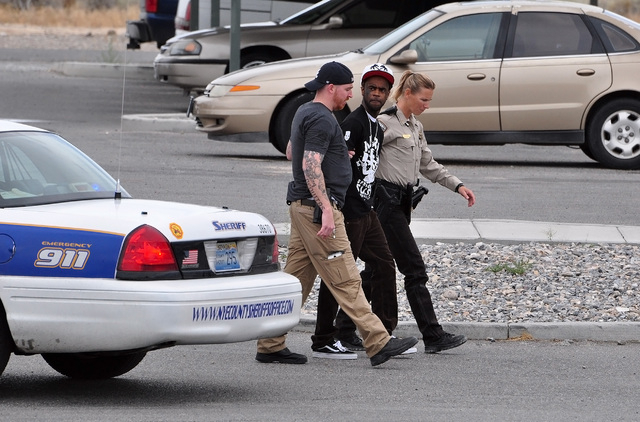 An apparent argument between a Pahrump couple quickly evolved into a barricade situation early Tuesday afternoon. Nye County Sheriff’s deputies and detectives responded to the Courtyard Apartments on Dandelion Street just after 12 p.m. for a domestic violence call. A section of the complex was cordoned off as deputies took defensive and offensive positions to apprehend the suspect who was armed with a 9mm handgun. A sheriff’s office negotiator engaged the suspect over the phone in an attempt to calm the suspect and negotiate his surrender. The negotiator was able to convince the suspect to come out of the apartment unit unarmed with arms raised. The man was then placed under arrest with no further incident. No details were released regarding the nature of the argument or how it escalated to the point where deputies were summoned to the complex. The situation was one of several domestic violence-related service calls for sheriff’s deputies on Tuesday. The identity of the suspect has not been released by the sheriff’s office. More details to come in Friday’s PVT.